The Peer-to-peer Dialogue on Human Right to a Healthy Environment and Sustainable Development Goals was organised as part of the on-going partnership between SwedBio/Stockholm Resilience Centre, the International Development Law Organization (IDLO), Natural Justice, UN Environment and the Office of the United Nations High Commissioner for Human Rights (OHCHR) – Special Procedures. The Dialogue brought together around fifty legal practitioners, government and inter-governmental officials, human rights and biodiversity experts, and environmental human rights defenders. 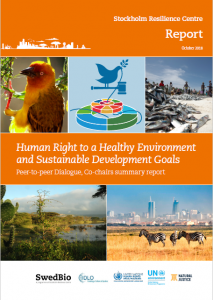 The outcomes of this Dialogue include conceptual and practical contributions for the global recognition and implementation of the human right to a safe, clean, healthy and sustainable environment. Elements and strategies to incorporate SDG16 and principles of human rights into the post-2020 global biodiversity framework were also proposed. Outcomes of this process are feeding into global legal and policy processes in human rights, environment and Agenda 2030.